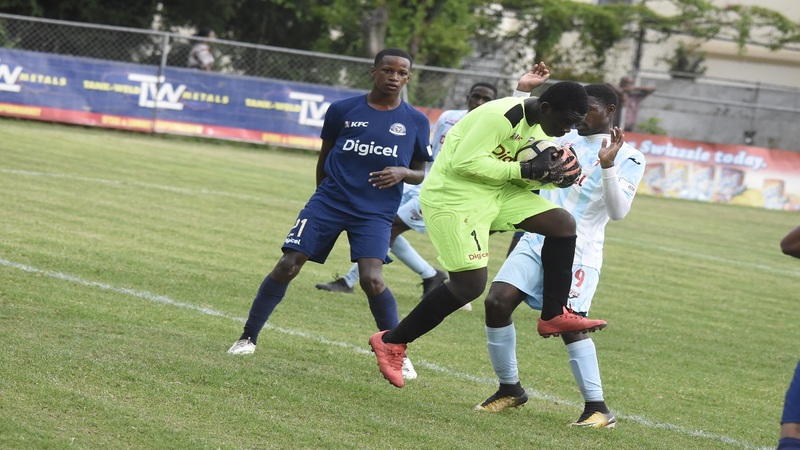 Maidson Hemley (left) of Cedar Grove High watches goalkeeper Jaheim Edwards collects cleanly ahead of St George's College Damani Harris during their return leg match of the 2018 ISSA/Digicel Manning Cup competition on Tuesday, October 2, 2018 at Winchester Park. St George's won 9-0. (PHOTOS: Marlon Reid). 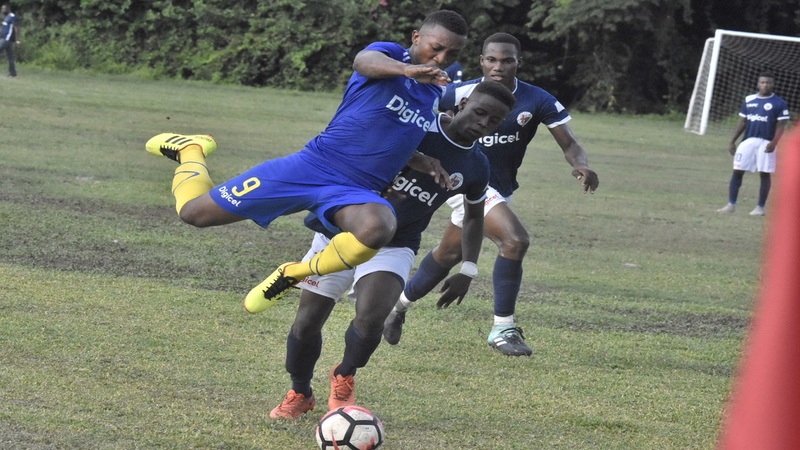 St George's College and St Jago High are on the verge of qualifying for the second round of the 2018 ISSA/Digicel Manning Cup football competition following Match Day 16 on Tuesday. St George's College moved within two points of qualifying after the seventh round of matches in Group A. The 22-time champions outclassed newcomers Cedar Grove High 9-0 at Winchester Park in their return leg match. St George's College had won 7-1 at Cedar Grove High when they first met on September 10. 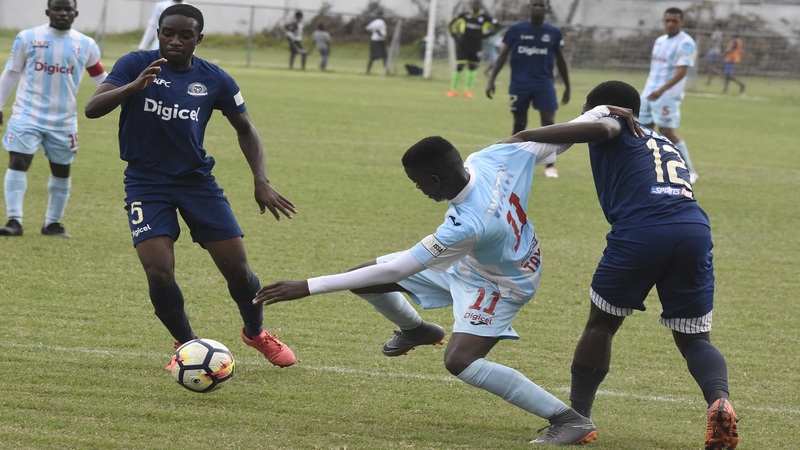 With three set of matches left in the preliminary round, St George's College remain atop the standings with 19 points, a four-point lead over last year's beaten finalists St Andrew Technical High School (STATHS), which drew 0-0 at Papine High. In the group's other game, Cumberland High won 2-0 at Tarrant High to remain in the hunt for a spot in the second round. With the victory, third-place Cumberland High moved to 11 points, four behind second-place STATHS and eight behind leaders St George's College. St Jago High edged Tivoli Gardens 1-0 in their return leg match at Prison Oval in Spanish Town to move within a point of securing their second round spot with three set of games to go in Group D.
The victory pushed leaders St Jago High to 19 points from seven games, a two-point lead over second-place Denham Town, which won 3-0 at Greater Portmore High. Third-place Innswood High beat Bridgeport High 2-1 at Chedwin Park in St Catherine to stay in the hunt for a second round spot. Chantomoi Taylor set up the big victory for St George's College with a first-half hat trick. Taylor scored in the third, 27th and 37th minutes. Damani Harris (51st and 55th) and Emelio Rousseau (66th and a minute into added time) both scored braces. Tyrese Bennett in the 54th and captain Cheva Denton in the 68th got the other goals for St George's College. The match was a one-sided affair for St George's. With the match only three minutes old, Taylor gave St George's the lead before bustling his way through the Cedar Grove defence for his second. A build-up, which was switched to the right flank ended with Taylor placing the ball into the net from the top of the 18-yard box for his hat-trick. The second half once again started disastrously for Cedar Grove High when they failed to properly clear a corner, which Harris pounced on to get his first goal, with the second coming when he was released inside the area by Denton with a through pass. A build-up by St George's ended with Rousseau getting his first goal and he added his second with a beautiful curling goal from the top of the 18-yard box with time winding down. Bennett was set on course to goal with a pass that he converted and Denton shot from the top of the 18 through a number of players and into the net. 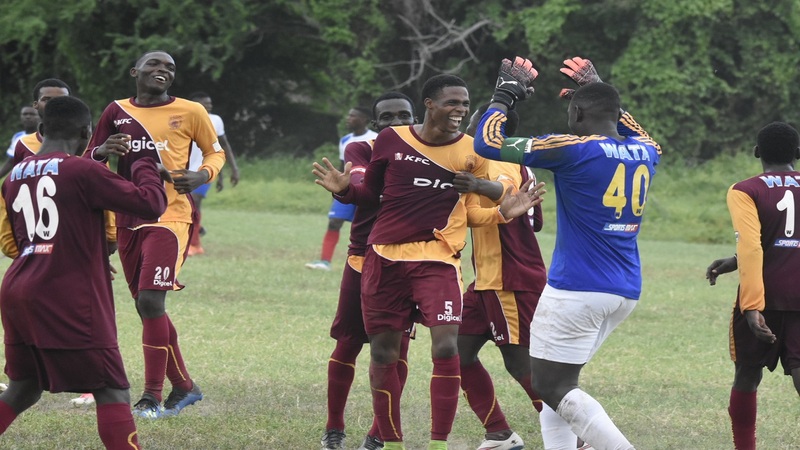 Meanwhile, 14-time champions Kingston College (KC) stretched their perfect win record to seven-straight victories after a 5-0 triumph over Dunoon Technical at Rockfort Football Club. The 'Purples' now lead Group B with maximum 21 points from seven games, a five-point lead over second-place Mona High, which battled to a 1-1 draw with visitors Calabar High. Red Hills Road-based Calabar High (13 points) remain in contention for a second round spot with the point earned. At the conclusion of the preliminary round, the first two teams in each of the seven groups will advance to the next round. The best third place team/next best third place teams will also qualify for the next round. Those two places will be determined by the number of points earned divided by the number of matches played.